For more than a century Volunteer Park has been the center of Seattle's park system. Though the city began purchasing this site along the crown of Capitol Hill in 1876, more than 15 years passed before the municipal government began to clear the land. Improvements accelerated after the turn of the century, when Seattle joined many other American cities in creating extensive networks of parks. In 1903, the Olmsted Brothers, America's most famous landscape architects, issued a comprehensive plan for parks, boulevards and playgrounds throughout Seattle. Named to honor the men who had enlisted to fight in the Spanish-American War, Volunteer Park featured classic examples of Olmsted design: adaptations to and reflections of the land's natural features, plantings added so cleverly they seemed native to the site, curving paths that provided ever-changing vistas and the inclusion of recreation facilities such as playgrounds. 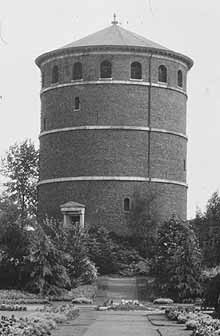 Their proposal that the park include an observation tower was fulfilled in 1906, when the city built a water tower whose deck, open to the public, provided panoramic views of downtown, the harbor and the Cascade and Olympic Ranges. Between 1906 and 1912 the citizens of Seattle authorized several million dollars in bond issues to fulfill most, though not all, of the Olmsteds' proposals for Volunteer Park and the rest of the city. 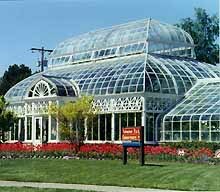 Since that time Volunteer Park has received a number of additions: a conservatory for exotic plants, five supporting greenhouses and an art museum (now specializing in Asian Art). Today the 48-acre site remains Seattle's most intensively used park, welcoming those interested in flora, fine arts, recreation or simply a quiet break from a busy city. Volunteer Park is located at 1400 East Prospect St. and is open to the public. It is jointly owned and maintained by the Department of Parks and Recreation and the Water Department. For more information call 206-684-4075 or visit their website.